to find an entire Star Trek episode filmed mostly out at regular, literally down-to-earth locations. where most of its locations are places you can visit right here in Southern California. 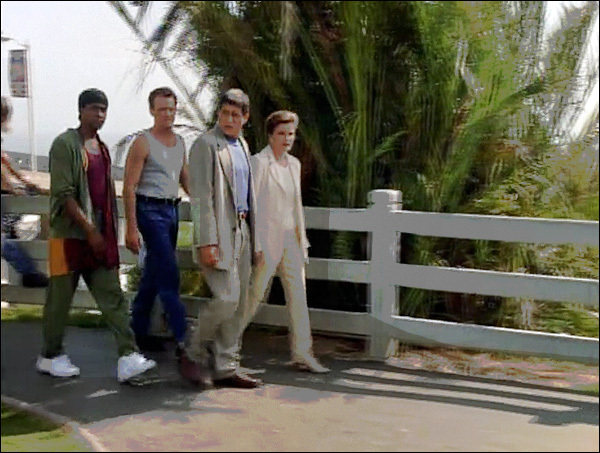 they wind up in Southern California, in 1996, at what is supposed to be the Venice Boardwalk. 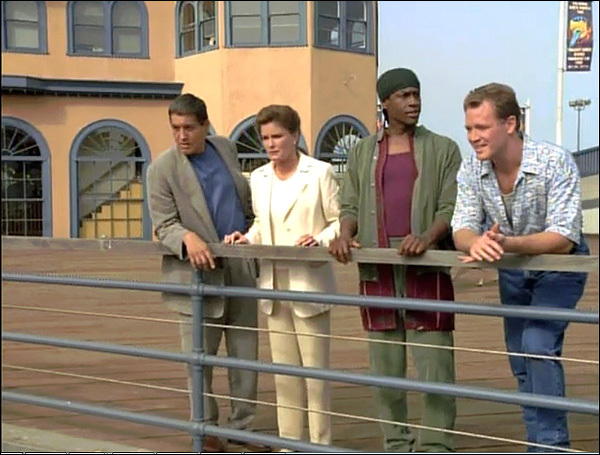 However, in reality, this scene was shot at the Santa Monica Pier. (which was featured in the movie "The Sting"). The pier is north of Venice, on the beach at the west end of Colorado Ave, in Santa Monica. Here is a Google StreetView of the building. a 29th century time-ship, who has been stranded on 20th century Earth for 30 years. 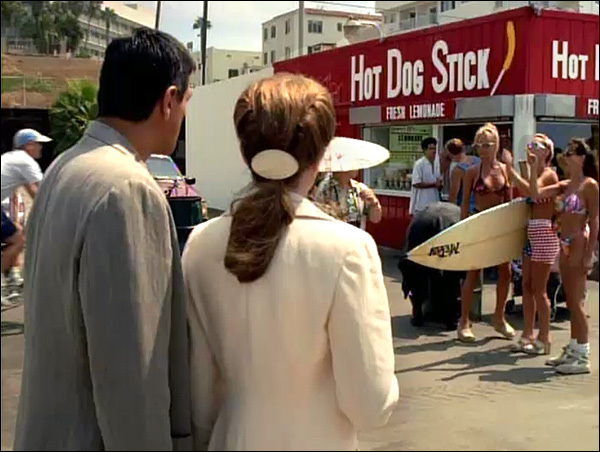 As they follow the bum, they pass another local landmark: a bright, red Hot Dog on a Stick stand. near what is known as Muscle Beach. The chain grew to have over 100 locations, in 14 states. The official address for the stand is 1633 Ocean Front, Santa Monica. Here is a Google StreetView of the stand (as seen from Appian Way). observatory, and has an interest in meeting visitors from outer space. She's about to do just that. 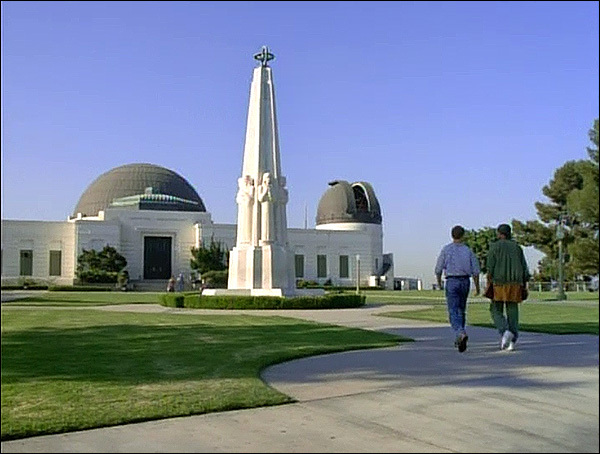 This scene was shot at the famous Griffith Park Observatory, in the hills above east Hollywood. 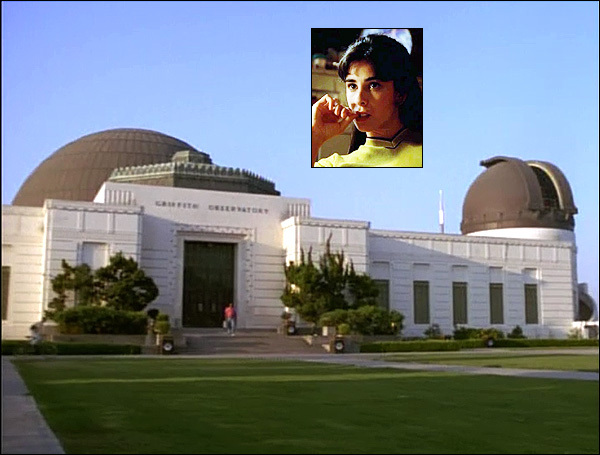 The address is 2800 E. Observatory Ave, Los Angeles, but you get there by taking Vermont Ave.
seen it in everything from "The Terminator" to "Rebel Without a Cause". Here is a Bing StreetSide View of the landmark. a Bill Gates-style computer magnate whose company, ChronoWerx, has led the 20th century computer revolution. time-ship), and has been slowly introducing the advanced technology as new products from his company. 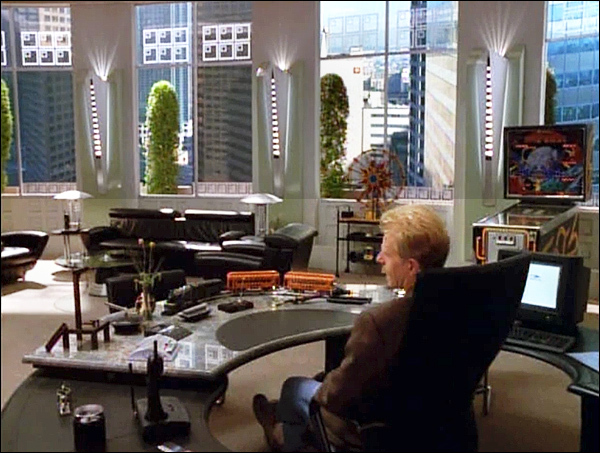 We see him inside his office, located on a high floor of the ChronoWerx skyscraper. Wells Fargo Center, located at 333 S. Grand Ave, in downtown Los Angeles. 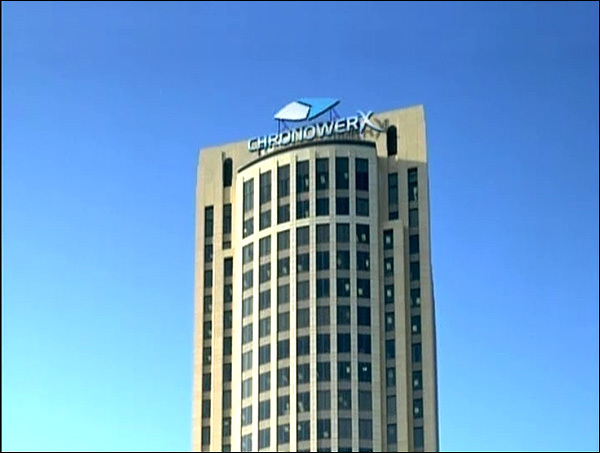 But the exterior of ChronoWerx (seen below) is not the Wells Fargo center. located right behind (east of) Union Station, at One Gateway Plaza, in downtown Los Angeles. Here is a Google StreetView panorama of the building. 16:00: As they follow the bum (Braxton), we see the crew walk through a park. near a spot where you'll spot a large cannon on display. from the pier north to past San Vicente Blvd, offering spectacular coastal views. homeless problem, and many of them tend to congregate at the this south end of the park. 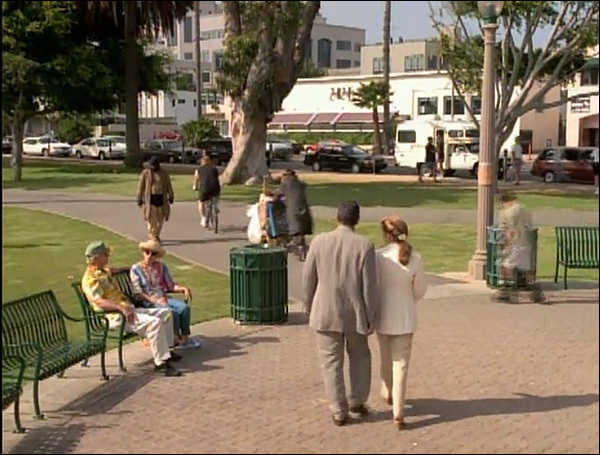 Here is a Bing StreetSide View of the park. 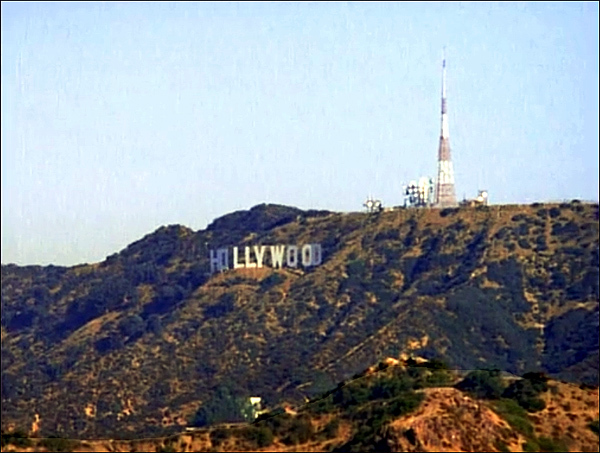 25:00: The next scene opens with a shot of a familiar landmark, the Hollywood Sign. The Sign is located atop Mount Lee, in the Hollywood Hills. which is southeast of the Sign's location (which sits atop Mount Hollywood). with a phaser. A phaser battle ensues in the parking lot. 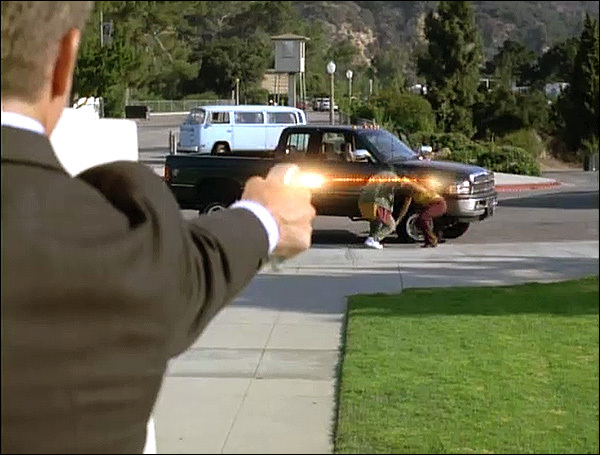 Their truck is vaporized. Galileo, Copernicus, Isaac Newton, Kepler, and others. 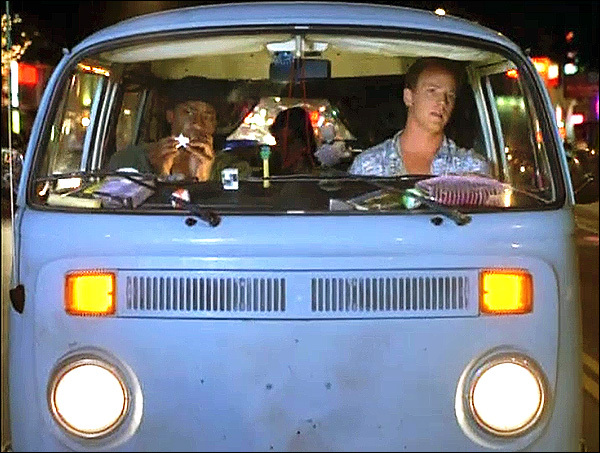 This driving scene was shot traveling west on the 7400 block of Melrose Avenue, in Los Angeles. If you'll look at the screencap below, on the far right you'll see a sign reading "Corleone's". That was restaurant was located at 7455 Melrose Ave. (the space now houses "Cellar 55"). 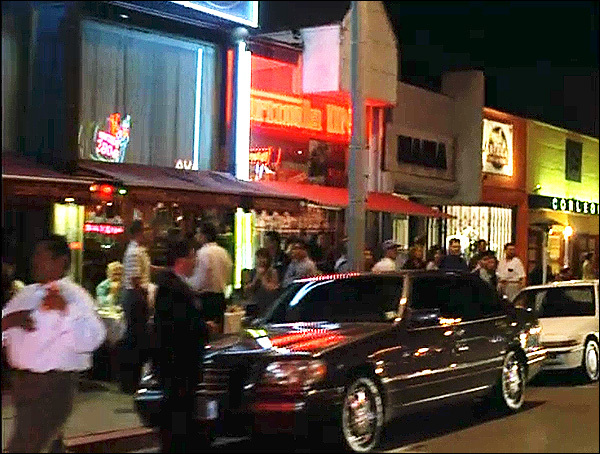 The awning on the left side marks the current location of "The Foundry" restaurant & bar, at 7465 Melrose. Both storefronts are on the north side of Melrose, between Gardener & Vista Streets. That's about half a mile northeast of The Grove and Farmers Market. More "Star Trek Voyager" locations! 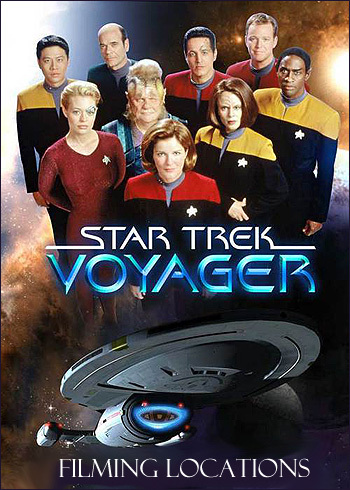 The photos on this page are stills from "Star Trek Voyager"